The Second Judicial District Commission on Judicial Performance, on a vote of 10-0, unanimously recommends that Presiding Judge D. Brett Woods BE RETAINED. 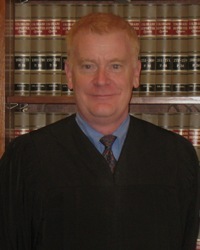 Judge Woods became a District Court Judge for the Denver Juvenile Court in September 2007. In January 2014 he was appointed Presiding Judge of Denver Juvenile Court by Chief Justice Michael Bender. Prior to his appointment, Judge Woods served as a Municipal Judge and County Magistrate for Denver County. Judge Woods also served as a relief judge in the Aurora Municipal Court. Judge Woods received his bachelor’s degree in journalism from the University of Kansas in 1982 and his law degree from the University of Denver College of Law in 1990. For this evaluation period, selected members of the Commission observed Judge Woods in court. The Commission interviewed Judge Woods, reviewed several of his written opinions as well as his self-evaluation, and reviewed the results of surveys sent to attorneys and non-attorneys. Overall 72% of respondents recommended that Judge Woods be retained. Of attorneys completing the survey, 78% recommended retention, 11% made no recommendation, and 11% recommended he not be retained. Of non-attorneys completing the survey, 66% recommended retention, 22% made no recommendation, and 11% recommended he not be retained. (These percentages may not total 100% due to rounding.) A total of nine attorneys and nine non-attorneys completed the judicial performance surveys regarding Judge Woods during this evaluation. The Commission recognizes that this is a small number of responses to the survey. Judge Woods’ retention scores were average among attorneys responding to the survey, and below average for non-attorneys responding to the survey. Judge Woods’ surveys also included evaluations from appellate court judges who were asked to rank his “overall performance as a judge.” The appellate judges who responded to the survey rated Judge Woods’ overall performance higher than average for district court judges. Respondents to the surveys noted that Judge Woods’ strengths include his demeanor in the courtroom, as well as fairness and being unbiased. In fact, Judge Woods received a 100% score for being unbiased by the attorneys who completed the survey. The main criticism of Judge Woods in the survey results focused on his diligence as a judge, specifically for not setting reasonable schedules for cases and for time management in court. The Commission discussed these criticisms with Judge Woods during his interview, and was satisfied that Judge Woods is aware of the criticism and is taking steps to improve the efficiency of his courtroom.